Daily Illuminator: Today Is GM's Day! March 4, 2012: Today Is GM's Day! As we mentioned a few days ago, today is GM's Day. Over at e23 we've honored their contribution by releasing eight classic items to help your gaming groups get together and let their table leaders do what they do best: get everyone to have fun. 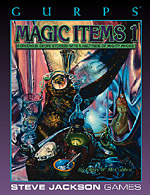 • GURPS Classic: Magic Items 1 -- An assortment of eldritch objects to delight your friends and smite your foes. 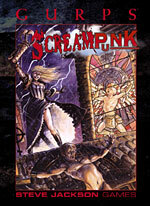 • GURPS Classic: Screampunk -- A mini-sourcebook that showcases the intersection of Victorian steampunk and Gothic horror. • GURPS Traveller Classic: Rim of Fire -- A reference to the 400 worlds and star systems of the Solomani Rim. • In Nomine: Angelic Player's Guide -- The guide to the Heavenly side of the War. • In Nomine: Liber Servitorum -- Rules for Infernal and Heavenly helpers on either side of the War, plus a selection of such Soldiers. • Car Wars: Combat Showcase -- A collection of vehicle designs for the 2037 season. • Car Wars Expansion Set 2 -- A set of color counters plus a turning key for Car Wars enthusiasts. • Uncle Albert's 2035 Catalog -- The latest and greatest goodies for Car Wars (as of 2035) from your old reliable pal, Uncle Albert™. There's already a thread on our forums devoted to reveling in how awesome your GM is; stop by and share your stories or read about others' cool GMs. And remember: On GM's Day, the players should be the ones who spring for pizza!